As lovers of gin and vodka, but not so much tonic, husband and wife team Tom and Talula set out to create a botanical mixer designed to complement the flavours in gin - and without all the sugar and quinine! The classic quinine flavours of tonic are swapped for a lightly carbonated blend of raspberry, sage and rose, giving the mixer a soft, natural sweetness that works well with the gin's juniper, and lets the true flavours of the spirit shine through. Using English garden botanicals with a hint of soft raspberry, this combination lends a sophisticated depth and length when mixed with gin. Low in sugar, each 200ml serve is under 40 calories, and contains no artificial flavours, preservatives or sweeteners. 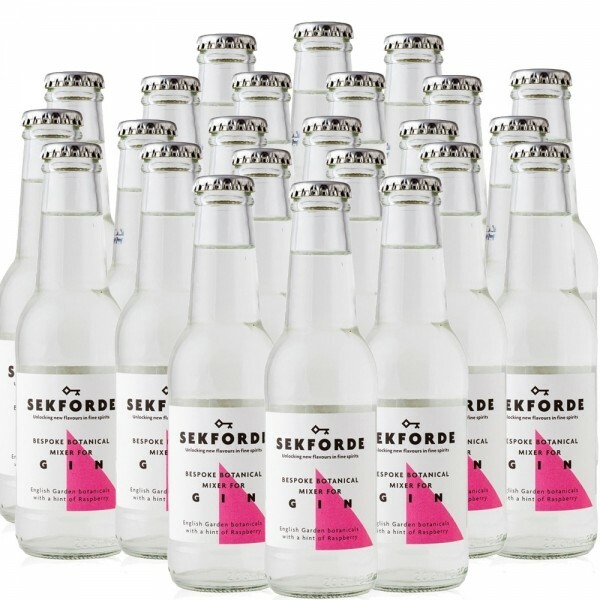 Sekforde is very versatile and makes a beautiful drink with both gin & vodka. We're enjoying ours with some festive sloe gin and a slice of orange. Stock up for Christmas shindig with this super-handy 24-pack.